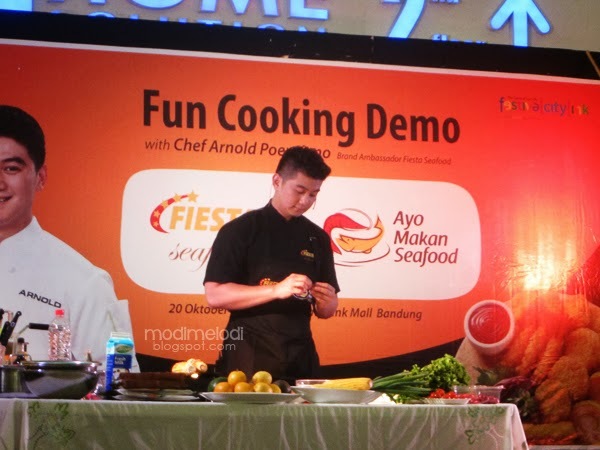 It was a great opportunity and obviously unforgettable memory for me being invited to attend an event held by Fiesta Seafood, "Fun Cooking Demo with Chef Arnold Poernomo". Who doesn't know Fiesta Seafood? A very popular processed frozen food manufacture. And, who doesn't know Chef Arnold? 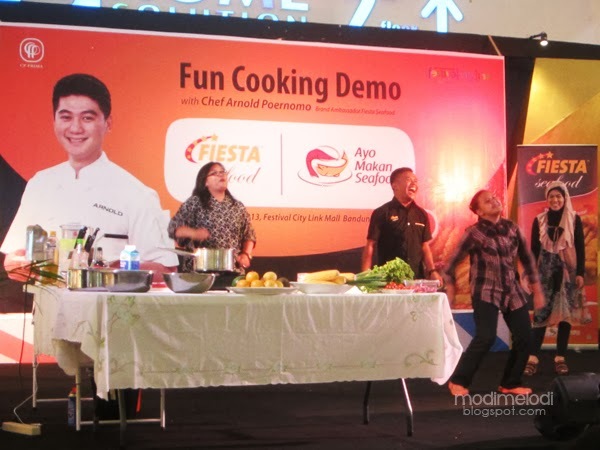 Oh, well not to mention if you don't reside around Indonesia, but I really heart Fiesta as much as I'm such a big fan of this young (and cute) chef. 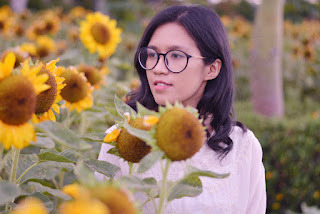 The lucky moment started when I won a quiz on my facebook blogger group, Kumpulan Emak Blogger (lit: mommy blogger, in English). It was a simple quiz asking "Who's the previous chef in Masterchef Indonesia whose substituted by Chef Arnold," you know the answer, right? Yeah! Chef Juna! Another chef I heart so much! lol. So here I am, among the other 10 lucky bloggers to get a ticket worth IDR 50,000 (and a chance to get photographed with that handsome chef!). 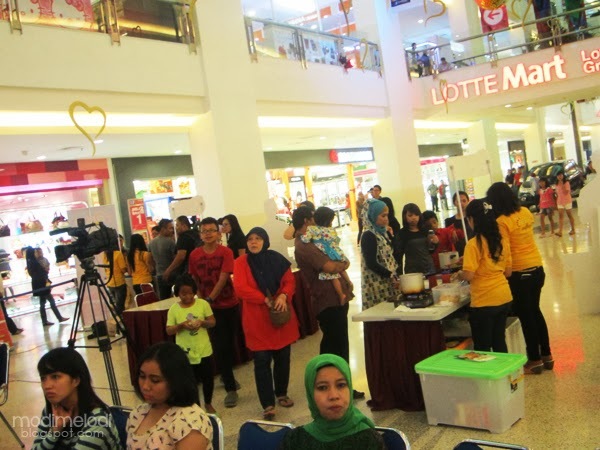 The event was held on October 20th 2013 at 2 PM in Lotte Mart Festival City Link Mall, Bandung (come to think of it, you may call me a lame reporter, yeah, I'm sorry! - now is November already). Let's keep it short. I arrived there at 2 PM, it was already crowded near the atrium where the event took place. I hurriedly walking to the registration desk since I had no idea what should I do and afterall I brought nothing instead my ID card. Luckily there wasn't any complicated procedures to claim my entry pass, just stated "I'm a blogger who (specially) got invited," to one of the committees, she then checked my name which easily found to be listed and.. Hey I'm in along with the ticket on my hand. Actually, if you didn't have the ticket, people can still buy ticket. And, if you hadn't tried fiesta seafood yet. 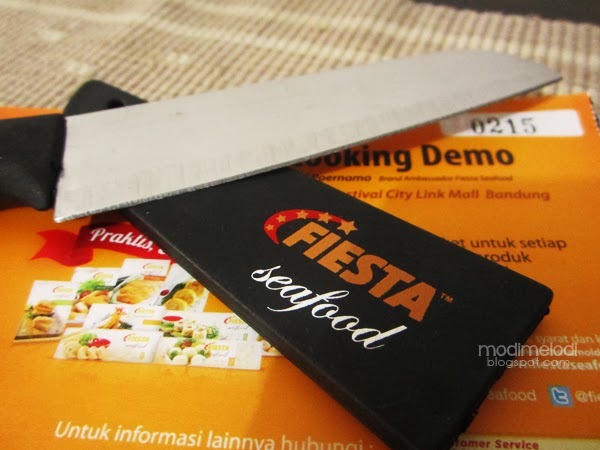 there were also stands to buy Fiesta Seafood directly; raw, fried, grilled, you choose - sadly not with cheaper price. Since we're at the mall atrium, everyone can freely watch the event, but by getting the ticket you can be more personal.. Um, like really sit near the stage (I did! ), otherwise people needed to struggle finding a perfect (and free) spot or went upstairs to watch from above. It was 2 pm and an MC appeared to open the event, I was sitting alone separated from my other bloggers fellow (well, there was a slight misundestanding the way I couldn't contact them and how their cellphone got no signal). But I think, I was on a good spot where I still could see everything clearly. 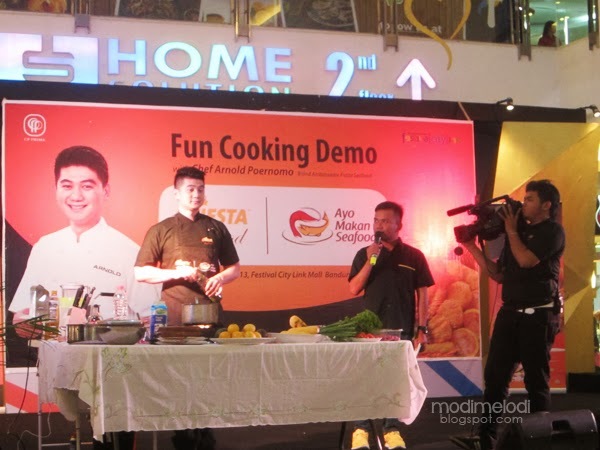 Goyang Cesar at Fun Cooking Demo with Chef Arnold, Bandung. The MC was obviously crazy, (we even were forced to hear him singing with his out-of-tone voice at the beginning), but he really guided this whole event professionally (well, for me)- he even made a "goyang cesar" contest where 3 women were challenged to dance on stage! The prize was kinda tempting so actually it brought no regret to the winner who indirectly has entertained us. 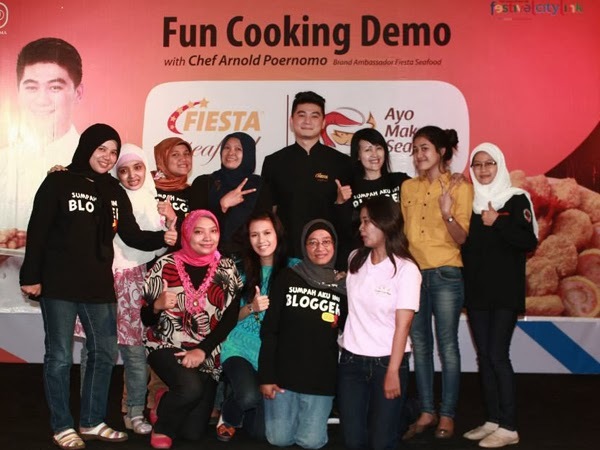 Then, he announced that there will be a live tweet contest and 5 winners with the most tweets will get the chance to get photographed with Chef Arnold! Really! I just couldn't miss that opportunity, and then you will see me drowned with my cellphone for the rest of 2 hours. LOL. But trust me, it's worth! 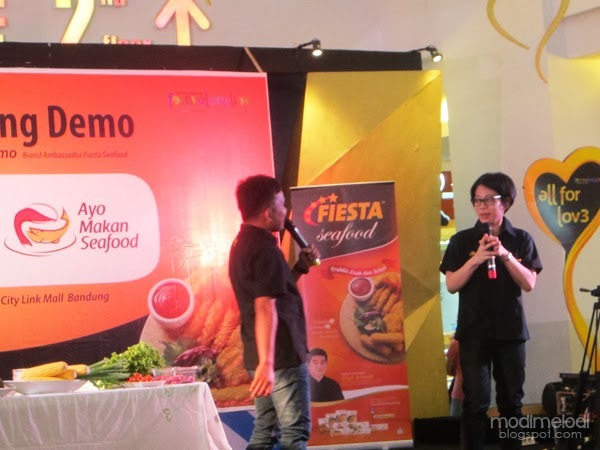 After followed by this-and-that little quiz and doorprize (which I will-and-never win), there was Ms. Anna Wibowo, Fiesta Seafood Brand Manager explaining about the purpose of this event. 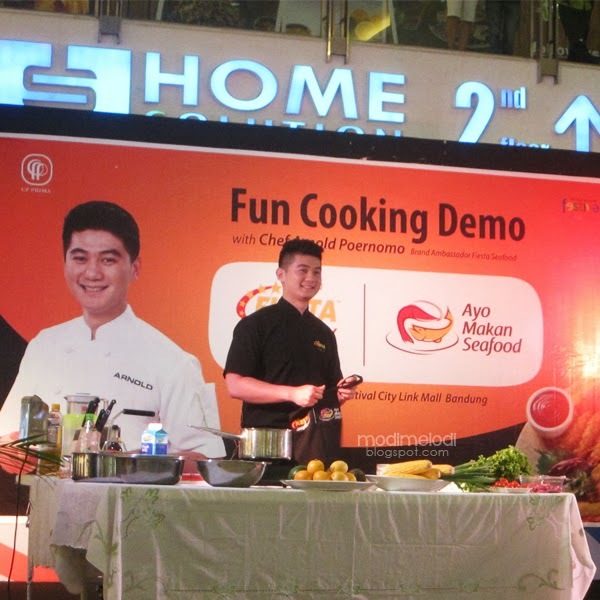 Fun Cooking Demo with Chef Arnold is one of Fiesta Seafood campaign forms to attract people eating seafood more, their tagline is "Ayo Makan Seafood" (lit: Let's Eat Seafood, in English) and is fully supported by Indonesia Ministry of Marine Affairs and Fisheries. Awesome! Fact that Indonesian people known to eat less seafood than Vietnam, Cambodia, Malaysia, Singapore, Japan, and Korea is quiet surprising since Indonesia is situated in archipelago territory. Oh, well, my bf even don't eat seafood, cause he holds some allergic, no offense then -and actually I don't have that nerve to cook crabs! People keep saying that eating seafood may harm your health: it's poisonous and contains allergic (bf said! ), not to mention fishy, also hard (and too lazy) to cook (mom and I said! ), and some other illogical excuses. But the fact: eating seafood is healthier than meat because it contains omega-6 which can lower 'bad' cholesterol levels. Talk about allergic caused by seafood, it's mostly because some people eat no-longer-fresh seafood. Now I know that 'fishy' smells caused by unfresh and old products of seafood. So it's better for someone to be able distinguish between fresh and old seafood products. just to find the fact that this product is really safe and healthy! Recommended. However, say goodbye to all your worries cause Fiesta Seafood will bring you no pain for eating seafood. Processed in the biggest seafood factory produced by CP Prima and its subsidiaries (CP Bahari ) in Lampung, Indonesia: all the products are professionally treated by keeping it fresh, uncontaminated, and kept in (-45) deg C while processed and (-18) deg C while distributed. And moreover Fiesta claims their products don't contain preservatives and colors; red and green color. 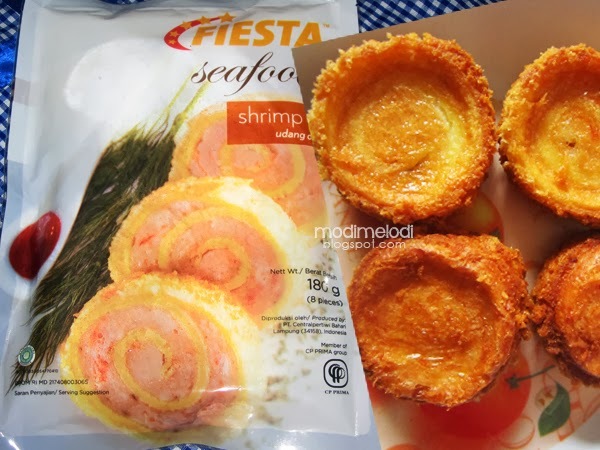 And another good things, eventhough appeared as frozen food, Fiesta Seafood products still contain the origin of seafood itself: omega-6, omega-9, essential amino acids which are very important for health , making the Fiesta Seafood as safe products consumed by everyone for breakfast, lunch, or just anytime! Ok, enough saying, time to cook! 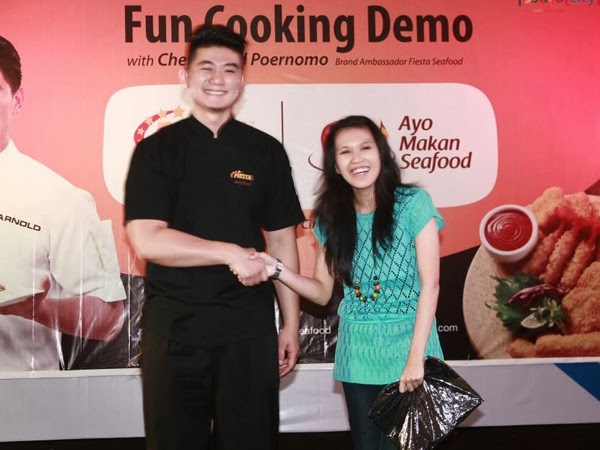 Short introduction about Chef Arnold Poernomo instead going to wikipedia: he's born in 1988 -way so young! He spent his childhood and teenhood in Australia (around 10 years) makes him speak English more fluently than his Indonesian. His first appearance was in Masterchef Indonesia Season 3 replacing Chef Juna which was currently busy with his own cooking tv program. His specialties are western food which is hard for me to follow. And he doesn't like being embraced by strangers! And it happened on this show where suddenly a woman who was lucky enough getting a prize running on stage and hugged him! Everyone gulped! 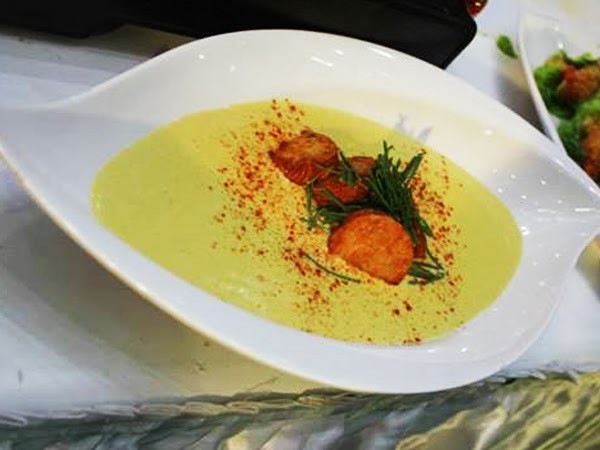 On this event, I was so grateful to be able witnessing two dishes he cooked; Ebi Fry Cocktails and Shrimp Tofu With Spices Corn Soup. He used so many imported ingredients which are so expensive and I didn't really think I would try to cook it at home, well, perhaps I will but not in the mean time. But maybe it's good to share the recipes someday. Ebi Fry Cocktails. Source: Fiesta Seafood Facebook. Well, I don't know what it tasted, since.... Gosh everyone was running after it once the show ended and I just able to captured it. But I can feel, it was tasty. Now I hope you know what to buy when it comes to seafood. 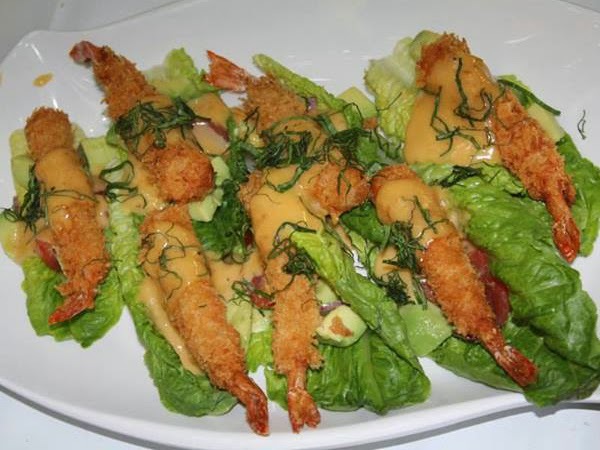 Fiesta Seafood Shrimp Roll. Definitely yummy detected. And, talk about live tweets. Yeah that live tweets contest that has made paying no attention toward Chef Arnold's every single step and instructions during his cooking process has led me to a big satisfaction (other than I didn't win the tupperware doorprize and quiz in the end). I WON THE LIVE TWEETS CONTEST! And what I got? 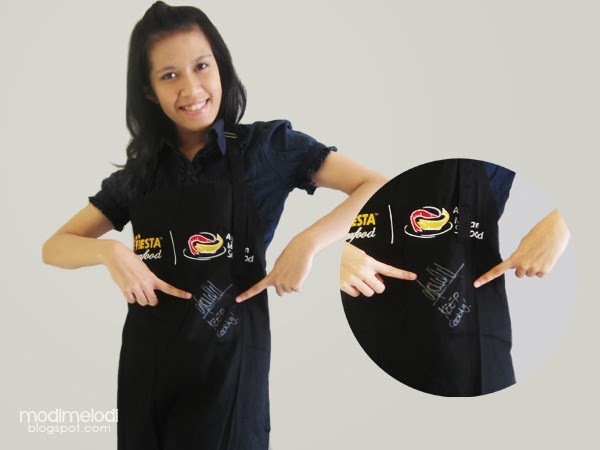 I got the chance to take a picture with chef Arnold as well I received a black signed apron from him. How blessed! It said "Keep cooking"
The happy things followed by the sad fact that I didn't listen carefully to the announcer saying we could swap the entry pass with a goodie bag! I missed the goodie bag filled with recipe book, cool knife, food storage and.. Oh, well. Forget it, better luck next time. After all I still can keep my entry pass and show you. And finally, I can meet up with my fellow bloggers! How relieving to know I was no longer stranded. It was my first time meeting them and it's interesting to get more friends with same interest and I hope we can catch up again on next meeting. And we took time get photographed with Chef Arnold, yay! Thanks to Nchie Hanie for this opportunity. And as closing, my picture of course! Gosh, I looked too happy it's embarrassing. Oh well, thanks for reading, see you!